Paolo De Dea, born in 1960, is a true globe-trotter. A two-wheeler who clocks up over 70,000km a year. His latest journey led him to face a foray across Iceland, which not only put a strain on his body but also challenged his BMW. He is now ready to set off for new horizons and will soon be hitting the road on a world tour! All the details are contained in this exclusive interview! Hello Paolo, in May you will be embarking on a solo world tour. How long are you going to be away from home and how much time has it taken to prepare? I think about 8 months, considering that I’ll be covering something like 60,000km, I will be flying over oceans and stopping over in some interesting locations and something unexpected is bound to go wrong and I could end up wasting as much as 50 days …… I will have to cover the distance in a little less than 200 days, with a daily average of 300km, which will be hard to cover in certain countries. The “WORLD TOUR” project was conceived 5 years ago as a result of major changes in my life but due to business and a number of personal commitments I had to put the whole thing on hold but I’m ready now though. What you are planning to do is pretty hard and a “physique du role” is essential. Have you trained adequately for an adventure that will push your body to the limit? You’re not that young anymore, are you? I turn 58 this year and I’m going to celebrate my birthday while travelling. I am following a diet to lose some weight, working out at the gym and I take a walk of at least one hour every day. This allows me to maintain strength and muscle tone as I age … oh, I miss my 20s! Aches and pains will soon creep up on you. Generally speaking, what kind of medication are you packing in your travel health kit? Apart from the specific drugs that I usually have with me (I suffer from hypertension) I’m going to be packing a few things: an anti-inflammatory and a wide-spectrum antibiotic, some pills for seasickness, because I’ll also be travelling by ferry and of course, a fully stocked first aid kit (gauze, bandages, sticking plasters, disinfectant, scissors and ointment for bruises and muscle strains); I might even fall, therefore scratches, minor cuts and bruises might be part of the trip. 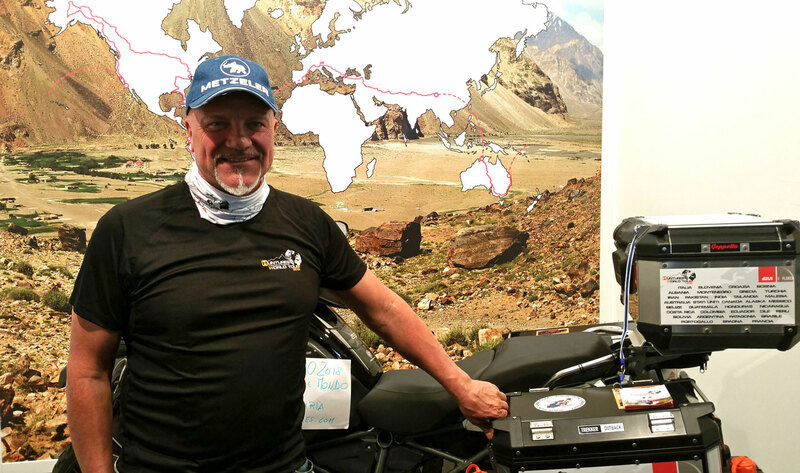 Along with your motorcycle, you were the guest of honour on the EXPLORER corner of the GIVI stand at the Motor Bike Expo. On the giant map, where your route was on display, we could see your departure from Italy, crossing the Middle East and Southeast Asia and then Australia; from there North America and then as far down south as Tierra del Fuego before returning to Europe from Brazil. How did you plot such a route? What was the alternative, if any? Africa is often left out of the picture, why is that? When planning to be away for so long, you have to bear a number of factors in mind: weather, how long it takes to obtain all the necessary visas, their duration and expiration and it is essential to have some anchor points in the case of an emergency, or simply just for routine maintenance. Once I understood that I could enter some countries only following certain dates, countries like PAKISTAN, MYANMAR and THAILAND, the most logical decision would be to plan a journey heading towards the “rising sun”, so that I could legally enter and exit those countries in no longer than a couple of months. Alternatively, I could have chosen AZERBAIJAN, TURKMENISTAN, MONGOLIA, SIBERIA with a ferry to Japan … this part of the world will certainly be a future destination. However, for this trip, I had to leave out Africa for a number of reasons: political instability in most countries, social dangerousness and very often, the bureaucracy to cross the country. Furthermore, after my journey to Iceland last summer, I realised that I can’t really ride my motorcycle on sandy soils because of its heavy weight. Whatever the reason, Africa won’t get away! In the years to come I’ll be there riding a more suitable motorcycle. What made you realise you were ready for “the great leap forward”? I don’t think I’ll ever be ready, because every day there is a fluctuation of enthusiasm and doubts and fears, but I’m sure that when I kick off this ultimate adventure all my fears and doubts will vanish as if by magic. I’m sure there will be problems and unexpected events to face, though my willingness and determination will take over and be my guardian angels while I’m still planning and living my dream. For the benefit of our followers, we would like to take this opportunity to explain how to find the correct documentation, equip and set up your motorcycle, the best luggage and how to budget. Thus, cost-wise and the technical/legal aspect. Let’s begin by talking about costs. What’s more of a bother? Moving from one continent to another, or daily expenditure? I ignored the costs and began by working out how and which resources I would need to face this journey. The first thing you should do is to create your route and calculate the total kilometres, even if it is just a “ballpark” figure, then the time needed to complete the adventure. In my case 60,000km over an 8 month period. You can choose where to stay (luxury hotel, tent, B&B, etc) according to your habits and needs: you can then start budgeting, setting down in black and white your expenses (lodging, food, fuel, maintenance, visa fees and long-haul flights). The majority of the countries I’ll be crossing have quite a low standard of living, therefore the cost for lodging and board will be greatly reduced and sometimes $20US a day is more than enough, give or take the odd dollar. The cost for fuel is calculated in the same way and it is likely to be about $0.70 a litre. Flying from one continent to another will affect the total cost by one third, as there will be three long-haul flights. And eventually, bureaucracy involving authorisations, health insurance and bank guarantees which all together would cost no less than $2,000US. If your motorbike is new, like mine, then there’s a high value to be covered in respect of the Carnet de Passage (Customs document). I was lucky enough to find companies interested in my trip, like GIVI, and that enabled me to reduce some of the costs. I am referring to the preparation of the bike and the selection of the accessories that need to be chosen according to convenience, capacity and reliability. 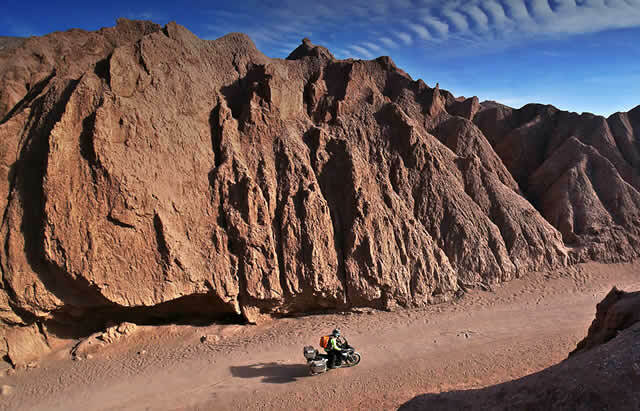 On this kind of adventure, the motorcycle has a major role. You have to care about everything as you will be covering long distances without any kind of support or technical assistance. Personally, to avoid a possible breakdown, I would suggest an engine and suspension check, replacing any worn-out parts, changing fluids and filters (some of which can be washed) and it is also worth having the electrical system checked. At the exhibition many people asked me why I chose hard cases instead of soft ones and why GIVI and not any other brand? Hard cases are better as they provide protection against dust, water, theft … and you can even use a detached case as a table if you want to eat. Last, but not least, if you fall, it is better to fall with solid cases on your motorcycle. Why GIVI cases? First of all, because they are the roomiest on the market and secondly, I have used them previously and they proved to boast an above-average sturdiness. We have closely followed your setting up. Does it really meet your needs? In addition to the trio of aluminium panniers, did you choose any other accessories? Is there a product that you personally find useful but isn’t part of the GIVI product range? A personal suggestion, perhaps? I mounted a pair of additional lights, foot pegs, a phone and accessory holder on the handlebar, a tool box, two waterproof roll bags on top of a duffel bag and a tank bag. Congratulations go to GIVI for having the idea to produce a tankbag with a lock that can be secured to the tank. What a great idea! Also, a USB kit/recharger was a must. Your bike, embellished for long journeys, looks like a spaceship on wheels. It is an extremely reliable 2017 BMW R 1200 GS ADVENTURE LC. Are you fond of the German brand? Yes, in recent years, I have ridden several BMW’s and I can see how versatile, manageable and reliable they are. Can you still “get your hands” on these motorcycles or do the electronics (which could sometimes be tricky) leave no room for intervention? Having too many electronics is a bit of a double-edged sword: if you break a unit, the only thing you can do is change it. Replacing it can be easy but you need to have the spare part with you and if you don’t, there is little chance I would be able to find one on such a journey, unless I have it shipped to me. On the other hand, it is true that electronics have an advanced reliability, more than mechanical parts and with a diagnostic device that can be purchased on the Internet for 20 Euros, you can quickly understand where the problem lies. Can you go into greater detail on the technical checks and the modifications to the standard equipment of your motorcycle? Sure, I can. First thing I changed was the air filter, with a special one from Guglatech, which besides being washable, delivers 20% more air intake. I then changed the battery for a larger one to support all the electric devices that I’d added. Due to weight and the very hot temperatures in certain areas, I chose a thicker oil for the shock absorbers. The tyres I chose are a good compromise between pure profile and road tyres: the ATLAS Goat R (they’re due to arrive at the end of February) and tests show great durability and performance. Are you going to pack any tools or spare parts? Sure, a kit for perforations, given the territories I will be crossing. A Torx Key set in order to mount motorcycle fairings, to change the filters and to recharge the battery; keys for the plugs, one for the oil filter and then pliers, thread, duct tape, plastic clamps, spark plugs and a spare filter and oil (the one that I know I won’t easily find). I forgot to mention a massive replacement: 2 tyres … because I’m travelling with tubeless ones which are easy to repair in the event of a flat tyre, but if it is cut or seriously damaged the only thing you can do is change it. I know that in some countries, I won’t easily find tyres that would be a perfect fit for my motorbike. Is there one country in particular that will give the GS a lot of trouble? Since the Achilles’ heel is the weight, all sandy paths will be a kind of burden. Whatever the case, I think the hardest territory, yet the most intriguing, is going to be South America. And the heaviest burden, on a bureaucratic level? The most bureaucratic is definitely the first leg of my trip to Jakarta. But in addition, some territories have put in place some very strict laws on entry, for example Pakistan, Myanmar, Thailand, Malaysia and Indonesia. Are you going to be connected with the rest of the world? If so, How? Well, first of all, I will write my media file reports and WI-FI permitting, I will upload them to both the GIVI EXPLORER portal and my personal website. I’m also considering the feasibility of doing some live streaming on a national radio station. If I succeed you’ll have the chance to not only read about my travels, but also hear the sweet sound of the engine and fully immerse yourself in my adventure. We’ll be following you very closely!